Many years ago, I went on holiday to Sweden with my brother, Nick and my sister, Julia. We stayed with a friend, Jakob, at his family’s cabin. One day, Jakob took us out on his boat to a deserted island. It was amazing: we had our very own island for the day! After we’d run all over it, screaming with excitement, we decided to go for a swim. While Nick, Julia and I were still getting used to the idea, Jakob plunged into the water, swam to a cliff, climbed it then dived back into the sea. Jakob also used to go jogging with rocks in his rucksack. He must have made a big impression on me because many years later I wrote Sunkissed, featuring bronzed Skandi-God, Leo. The photo above was taken at the exact moment Jakob jumped into the sea. 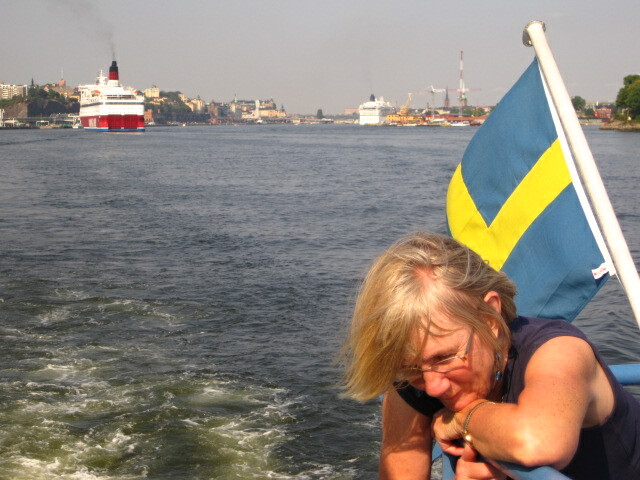 When I knew I was going to set a book in Sweden, I went back on a research trip with my mum and visited an island in Stockholm’s archipelago called Grinda. I turn Grinda into the island of Stråla in Sunkissed, where Kat is sent for the summer. Here’s a picture of my mum as we travelled to Grinda. You can see Stockholm behind her. My mum also helped me describe Frida. We stayed on a hotel boat in a tiny cabin. There was a heat wave when we were there and Mum removed all her clothes the second we got into our cabin. I was always a metre away from her naked bum. Fortunately, when we went on the boat trip she decided to put her clothes back on. It’s always fun taking characters out of their comfort zone which is why, in Sunkissed, Kat accidentally enters an endurance race called Tuff Troll. In my fictional race, teenagers have to run around Stråla, swim to another island then kayak back. There is a real endurance race that takes place in the Stockholm archipelago called ÖtillÖ. It’s ranked as one of the toughest endurance races in the world and competitors swim and race over twenty six islands…in one day! ÖtillÖ began as a bet between two men. As one of the men says, he was driven to find out what he could do and achieve during his short time on earth. When Kat takes part in Tuff Troll, she discovers she is capable of far more than she ever believed possible. I love running, but this hasn’t always been the case. When I was at school, I had asthma, I was short and I wore glasses. I was always one of the last students to be picked for a team and I believed I was hopeless at sport. It now gives me a huge sense of satisfaction to run for miles across the Downs and I’m slightly surprised that I can do it. When I run, feel mighty…even though I’m still a short, glasses-wearing asthmatic. No, I’m not talking about Leo’s awesome physique, but the lovely buttery swirly cakes that are available all over Sweden. Stockholm actually smells of cinnamon buns. When Kat’s heart is broken, cinnamon buns keep her going. I like baking them and here’s the evidence! I love a disco. All I can remember about being 18 is going to lots of 18th birthday parties with my BFF Lorna and dancing for hours to It’s Raining Men and Dancing Queen. I definitely did some A-Levels at the same time, but it’s sitting on the floor of a function room above a pub singing along to James’s ‘Sit Down’ that’s stuck in my mind. I love music. I listen to it when I write, when I run and whenever I’m in the car. I go and see bands all the time. If I’m out running and my iPod runs out of battery I walk home because my run has just become boring exercise instead of a disco. Music basically makes life better. All my books have music running through them, and Sunkissed is no exception. When I include music in a book, I try not to use any songs that are too contemporary as they will date the book really quickly. Here’s my Sunkissed playlist. If you listen to these tracks while reading the book and eating a cinnamon bun or two, you’ll be having the perfect Sunkissed experience! In Sunkissed, fifteen-year-old Kat is sent to Sweden for the summer and she really doesn’t want to go. As she’s going to the airport Someone Like You comes on the radio and her dad starts to sing along at the top of his voice. Then her friends join in. I love the idea of everyone in the car belting out a power-ballad…except Kat. She’s staring out at the rain filled with dread about what’s about to happen to her. Power-ballad #2. 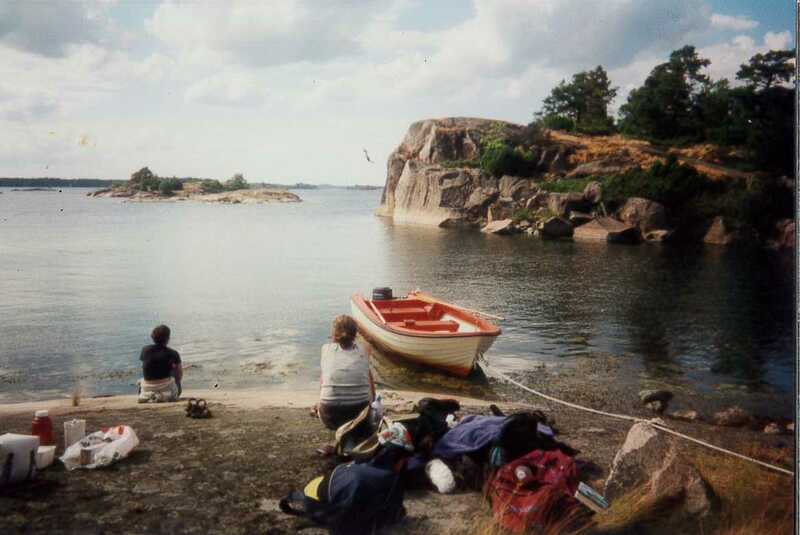 Once in Sweden, Kat’s Auntie Frida drops a bombshell: they are actually going to spend the summer on a tiny island with one shop and no phone reception. How will Kat survive? Once there, she’s dragged to a disco where she sits at the side and watches everyone else having fun. This song comes on and Kat knows all the words because her mum and dad sing it to each other. Kat’s been waiting for a boy to sweep her off her feet (her hero) and he’s just about to appear. Kat is standing in the sea when she hears this Euro-disco classic drifting across the island. There is a full moon and the sea is beautifully warm and totally still. Kat has a mad urge to rip off her clothes and go for a skinny dip, after all, there’s no one around to see her…is there? Fast-forward a chapter or two and Kat is sitting in a café by the sea watching the sunset. Even better, a gorgeous Swedish boy is sitting next to her. What could go possibly go wrong? When this song starts playing, Kat looks across the café and suddenly the words ‘Lovefool’ take on a whole new meaning. In a furious rage, Kat enters an endurance race called Tuff Troll only to discover she can only compete with a partner. Desperate to save face, she begs one of her friends to come to the island and enter with her. I don’t want to give too much away, but the friend who turns up has a tropical fish called Oyster (named in a comp by MP!er, Tiann) and she loves the Swedish pop superstars ABBA. Kat’s friend invents Fun Run to make their training bearable. The girls run round the island, listening to the same playlist and breaking out into synchronised dance routines. This is how Kat ends up doing the worm to ABBA in front of her mortal enemy. I’d love to try out Fun Run, but for some reason none of my friends will do it with me!